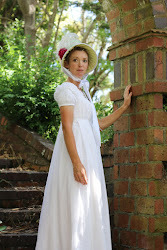 As you have seen in a previous post, I made a set of Short Stays for the new era I am focusing on: the Regency era. FYI, this was officially the years of 1811-1820 in England, while under the rule of the Prince Regent George IV, but the style of clothing started a few years earlier. The style was very skimpy, flimsy and whimsical, showing plenty of arm and bosom during the evening. I needed a new shift that wouldn't show under my new gown! I won't go over the general construction of the shift, as it is almost identical to the previous 18th century shift I made using this excellent instruction. The main differences were a shorter sleeve, almost to the point of a capped sleeve, a lower neckline, and this time I was experimenting with rolled hems and frilled necklines. 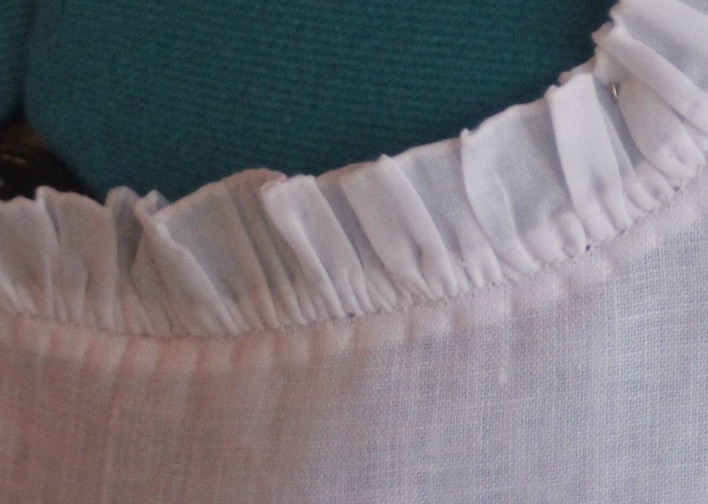 The rolled hem makes a lovely dainty edge, especially when used on a very fine fabric such as cotton lawn, as I have used here. To make a rolled hem, cut the fabric to the desired width (in this case, 2.5 cm wide) as close to the grain as you possibly can. If you are able to pull a thread out or out of place, this will help you get it right on the grain. A swipe along the fabric grain with soap can make pulling a thread easier! If not, just do the best you can by eying it up. Next, you dampen your thumb and finger and basically roll the long edge of the fabric, re-rolling as tight as you can. Roll up a couple of inches at a time. Hold this tight with your left hand close to where you are sewing. Knot and start off your thread inside the 'roll', picking up barely a thread or two from first the outside of the roll, then from the main fabric, just beside the roll. Keep your stitches tiny, maybe 2-3mm apart. 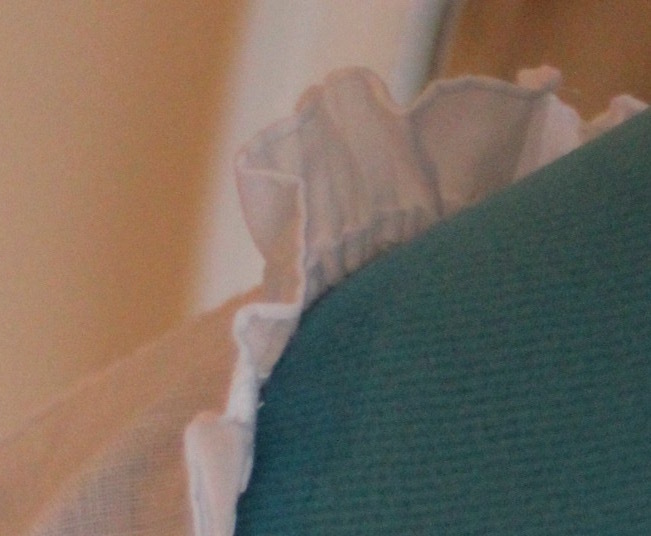 As you go, carefully pull your thread to keep the roll, but not so tight as to create a gather, as this is the outside edge of your frill. Continue until you get to the end, then tie off. For the other side of the frill, you can avoid both hemming, then gathering by doing a very niftly two-in-one stitch: the gathered rolled hem. For this I use a linen or a stronger thread. 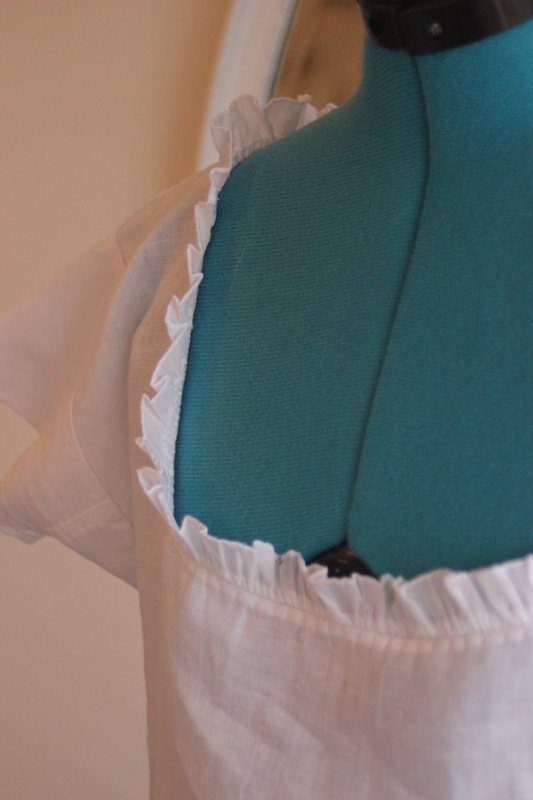 Sew your rolled edge the same as you have done for the outside of the frill, but this time, every few inches of sewing, push the roll up the thread, gathering it to the tightness that you prefer. This leaves a bumpy and gathered edge to your frill for a tucker, flounce or whatever decorative edge you are finishing. This is easy to whip to the finished neck edge or the inside of a cuff or cap and saves time hemming then stitching: simply unpick the whips if you need to wash (by hand), leaving the frill gathered. That is the only real point that differed from the normal 18th century shift, and it sits very nicely under the short stays. If you want any better photos or further information about the process, please feel free to comment.